It's not a coincidence that this software is called Ableton Live. 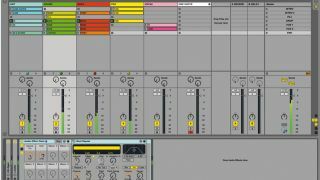 An Ableton Live set offers the electronic performer countless options for creative DJing, spontaneous remixing, live re-editing, processing and hands-on control. Here, we'll show you how you might go about setting up a Live project to use on stage. Step 1: Here's a basic layout of six track elements set up in Live's Session View, divided into horizontal Scenes. Each Scene can be fired by triggering its corresponding Launch button on the Master channel. Step 2: By triggering individual clips or Scenes with a MIDI controller, we can mix and match clip variations. Global quantisation is set to 1 Bar, meaning each triggered clip will begin playing exactly at the start of the next bar - everything stays perfectly in sync with the host tempo. Step 3: Only one clip per vertical row can play at once. Empty clip slots feature a Stop button that kills playback of any other clip on that track. By right-clicking an empty clip slot and selecting Remove Stop Button, we can have clips continue to play even when we trigger new Scenes. Step 4: We've set up Audio Effect Racks on various channels, each containing useful performance processing devices such as Auto Filter, Ping-Pong Delay and Beat Repeat. Multiple parameters are assigned to various Macros, and these can be assigned to a MIDI controller's knobs for on-the-fly effects. Step 5: Our One Shot channel contains a Drum Rack loaded with a selection of one-shot FX samples. These can be punched in throughout an arrangement via MIDI drum pads or a keyboard for quick transitional effects. Step 6: There are two Return tracks set up with reverb and delay, so individual channels can be sent to them for interest. This particular project is basic, but it gives you an idea of how a full track can be broken down and remixed on-the-fly. Download the Ableton Live project file.